Thirty four years ago, at this same hour, I was likely preparing for bed. Pregnant with my first child, I wondered if by some chance my child would be born on my due date, November 17. Wyndham, sick with a bad cold, had remarked that he hoped it would not be that particular night, given his sickness. However, as time would have it, a few hours later I woke him…knowing that we should to head to the hospital. About five hours after our arrival we welcomed our first-born, Melissa Allison, into the world. I’ll never forget the amazement of holding this miracle of new life that had been formed inside my body. Nothing could have prepared me for the joy of that moment. I felt for her the same anticipation described in Jeremiah 29:11, that God feels for his people. I had hopes and dreams for my new daughter. This scripture helped me better begin to grasp something of what God felt for me. He wasn’t out to harm me…he felt about me the way this scripture describes. The response to this love is up to us…as the scripture continues. Then you will call upon me and come and pray to me, and I will listen to you. You will seek me and find me when you seek me with all your heart. 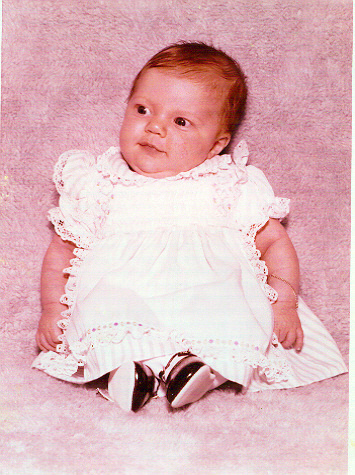 Thirty-four years later I stand with deep gratitude and admiration for the woman of God that this once tiny baby has become. I love her more than words can express. She has sought to please God with all of her heart, soul, mind and strength and her life has eternally affected so many. She brings her husband much joy, and is a pretty amazing mom. Often I marvel at what she gets done in a day. Her sensitivity and giving spirit to her family is extraordinary and she is one of the most loyal friends to others that I know. She truly inspires me. I just wanted to take a moment to share my gratitude for the blessing of the miracle that came into my life on November 17, 1977.